NBK wrote: Glancing through multiple materials from Honda, he makes it clear - Kano did not dismiss him because of his conversion to Christianity. Honda did convert to Christianity while Kano was abroad, and he and others discussed Kano's reaction to that, but Honda was dismissed because Honda, along with others, was entrusted with the management of the juku dojo while Kano went to Europe for extended study, and they did not, shall we say, provide proper oversight and prudent financial management during Kano's absence. When Kano returned he cleaned house, so to speak, but shortly later Honda remained on excellent terms with Kano. Kano later introduced Honda to positions that shaped his career, and apparently Honda voiced personal appreciation of Kano's guidance and discipline. At the same time, Honda is very clear that he thought Kano hated Christianity. Thank you for this, very much appreciated. Dear colleague, please excuse my late reply, but it has been quite hectic here in Ghent.... I certainly agree with your analysis of influences on Kano Jigoro. May I also suggest to take a look into Buddhist thought? The concept of jita is also used in Buddhist philosophy. Buddhist schools are for example divided into jiriki and tariki schools. Jiriki-schools rely on the power of the zelfs/person for enlightenment and tariki-schools rely on the help of the boddhisattvas and other helpers. Kano certainly opposed any form of religion as can be seen in his writings, however I think that it can be argued that certain philosophical concepts belong to the core of a culture. The ethical and moral system in Europe is for example very much influenced by Christian beliefs although life and law are secular now, the under current would still be a unconscious Christian grid of moral beliefs. The same could be argued in the case of Buddhism in Japan. Even people not believing in Buddhism can and will still be adapting Buddhist values as they are part of a cultural memory. But I can't track his citation of Buddhism - write large, sure, but Buddhism suffered huge declines in Japan during the Meiji Restoration. Confucianism was a much more pervasive cultural influence. In Japan Buddhism essentially merged with the native Shinto, and it was only in the early Meiji administration that they were separated by government edict. Recently I went to one of the top ranked Shinto shrine complexes in the country, almost a thousand years old. Nearby there are a couple of Buddhist temple complexes almost as old. Until the late 1800's they were essentially all Buddhist / Shinto temples, all related. After the establishment of the religion law, Shinto was separated and elevated above other religions; according to the Meiji government, Shinto was not even a religion but rather ".... Shinto was promoted as a public expression of Japanese ethnic identity and loyalty to the throne that all imperial subjects would observe, regardless of their private religious beliefs." http://rijs.fas.harvard.edu/crrp/papers/pdf/Hardacre_ReligionConstitution.pdf While of course Shinto acted as a religion, this artifice allowed people to practice their own religion while demanding public acknowledgement of Shinto and observance of certain minimum Shinto-like rites such as bowing to the Emperor's photo, etc. Even at those ancient temples, there is still a connection that the priests worked out. The Shinto gods enshrined at the Shinto shrine became the ujigami, household gods of the Buddhist temples so every year the senior Buddhist priests troop down to the Shinto shrine to participate in elaborate ceremonies celebrating the Shinto gods. There are hundreds of references to Kano's study of ancient Chinese texts associated with Confucianism and neo-Confucianism, and his own words in praise of Confucius and Confucian scholars, but I can't recall a single reference to a purely Buddhist text. In the "judo myth" category. Confessing ignorance here, or at least just enough knowledge to be dangerous, I wonder for example about one of the common practices in judo dojo in the US. That is, ending practice with "mokuso" followed by a few seconds of quiet squirming on knees unaccustomed to sitting seiza, followed in turn by "mokuso yame ... sensei ni rei". If one asks, one will be told that this has something to do with Zen. Having been involved with just a taste of serious exposure to Zen and meditation at the aiki dojo I belonged to in college ... with the real deal ... I wonder what the heck people are doing. You seem to be saying you can't find any Buddhist practice in Kano-shihan's method? One will find any number of serious judoka who believe that "Zen" is inseparable from all budo ... or what is sometimes labeled "bushido" ... including judo. Is it another example of pasting "Japanesy" externals on judo because it's Japanese? Can't be that entirely, it is common in Japanese-American dojo to include Buddhist externals ... many dojo are associated with temples. Heck, like Tenri folks who include judo practice as part of their religious activity. Is this a common trend of people bringing back into judo that which properly might be excluded ... like the "Judo 4 Jesus" patches some of my local friends wear on their judogi? This thread is interesting because it would be a common assumption among judoka worldwide that judo included Buddhist concepts, and that many would go looking for those practices in judo. An excellent question, I've wondered myself. It is not common in Japanese judo. It is in kendo. I expect that it bled over from kendo of another tradition. But not all mediation is Zen; various sects practice some form of it. Even Confucianism had a tradition of 'quiet sitting' meditation literally called 'seiza' but w different kanji; I've wondered if that had any impact! But Confucian seiza is very different from Zen meditation. Put simply Zen meditation is to empty your of thoughts, to literally think of nothing, while Confucian seiza was to quietly but actively contemplate your pending or past activity, organizing the mind for action. I've not combed multiple student texts for it but will someday. I've looked through some prewar judo instruction manuals. None show using meditation; in fact, they all seem to presume that judo instruction is given outside. They start standing in formation, there is a standing bow, then mass instruction in basic movement. When the boys (only males shown) are paired up, they execute standing bows (tatsurei) and get to it. Pretty much the same with kendo, although some show very deep seated bows. Reading this again, a couple of things jump out. Historically judo has never been cast in Japan as reflecting much if any Buddhist concepts. You could certainly make the claim that bushido and many neo-Confucian concepts and philosophy are intertwined, and claim that around 1930-1945, even earlier, that Shinto concepts were intertwined (period judo writings are very clear in teaching bushido and proper citizenship, which of course meant recognizing the Emperor as a deity / priest heading the national family and interests - which is all consistent with neo-Confucian concepts.) But not a sign of meditation. I wonder if that meditation was introduced to judo in the West by folks such as EJ Harrison and Trevor Leggett, who explored various Japanese cultural practices. I have never heard that Tenri practitioners study judo as part of their worship. I know that several Tenri temples have associated judo instruction, but have always thought that to be a Japanese cultural offering, not part of worship. I'd have to look back ... if I recall the story judo was brought into the Tenri observance by the spouse of the founder ... I could very well have that wrong. Maybe not as part of the belief system, but as something good for young people to do. But according to one of our dojo members, who spent a summer there, every day began with a lengthy chanting session. A chant he can repeat nearly two decades later. I mentioned this thread to him ... that's how it came up. The 'something good for young people to do' sounds right to me. Not the founder of the religion, a woman named Nakayama Miki that died 1887, but Nakayama Shozen (her grandson?) http://la-tenrijudo.com/index.php/history/ seems to be the source. I reckon that the chanting has zero to do with judo and a lot to do with Tenri. Just like the Judo for Jesus crowd. 天理教, Tenrikyō, for those that don't follow such, is a 'new' (established 19th century), relatively small (~2m?) monotheistic religion based in Japan. Although officially named one of the 13 sects of Shrine Shintō in the Meiji era, and superficially similar to casual (i.e., non-specialized) observers, it actually petitioned the Japanese government (postwar IIRC) to be removed from the Shintō category in the official registers, and was; it is now officially one of the 'other' religions. It must have been very well funded at some point because there are Tenrikyō training centers, usually largish Japanese style houses or buildings, scattered all over Japan. Tenri University, founded by Nakayama Shozen, has a strong judo and PE program. The team had some troubles with bullying uncovered last year along with a number of similar scandals so some heads rolled, but I guess they're back on track. I recently found a reference that claims Kano shihan was decidedly, avowedly atheist in no uncertain terms. It fits with other references I have. I never had doubts about that. Yes, I hope to have something for you later this year. I had a thesis and I keep finding documentary evidence that I was right. Kano shihan was a very interesting gent. 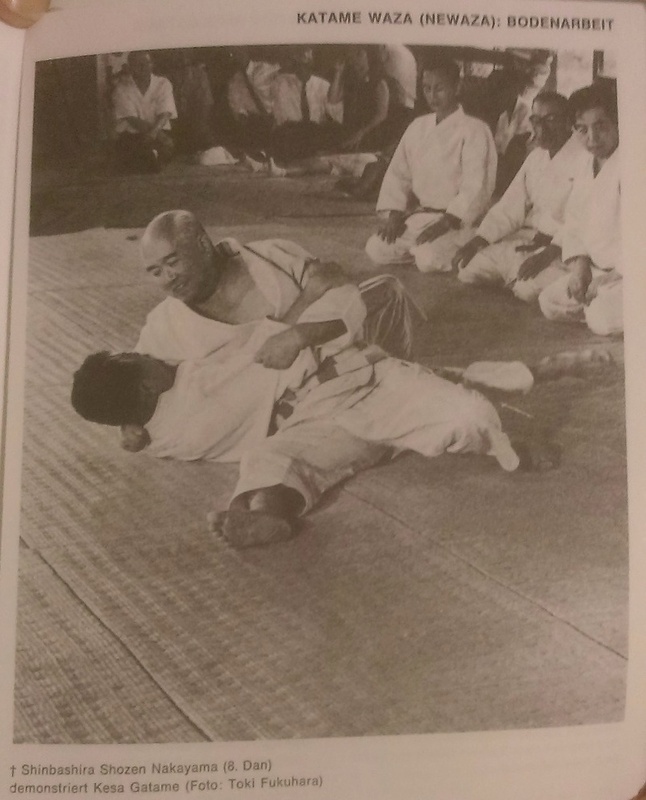 In book Judo Grunladen Technik (in deutch) from Maghito Ogho (teacher judo in Deutschland and Austria in around 1970s ) is this photo of his teacher in Tenri University - Shinbashira Shozen Nakayama. Shinbashira could be title "patriarch" in Tenri-kyo. Yes - 'Shinbashira' literally means the central pillar but in Tenrikyo the title goes to the central figure of the earthly religion. Nakayama Shozen was the second 'shinbashira' and founder of Tenri University. Salvation and judo - quite a combination.